Panj Pyare (Punjabi: ਪੰਜ ਪਿਆਰੇ, Pañj Pi’ārē, literally the five beloved ones), is the name collectively given to the five Sikh men,Bhai Daya Singh, Bhai Dharam Singh, Bhai Himmat Singh, Bhai Mohkam Singh and Bhai Sahib Singh by Guru Gobind Singh Ji at the historic divan at Anandpur Sahib on 30 March 1699. They formed the nucleus of the Khalsa, as the first batch to receive khanda di Pahul, i.e. rites of the two-edged sword. In Sikh theology, as in the Indian classical tradition generally, panj (ਪੰਜ) or paanch (पांच), i.e. the numeral five, has a special significance. Guru Nanak Dev JI in Japji refers to five khands, i.e. stages or steps in spiritual development, and calls a spiritually awakened person a panch. The ancient Indian socio-political institution panchayat meant a council of five elders. Something like an inner council of five existed even in the time of the earlier Gurus: five Sikhs accompanied Guru Arjan on his last journey to Lahore; the five were each given 100 armed Sikhs to command by his successor, Guru Hargobind Sahib; Guru Tegh Bahadur Sahib, set out on his journey to Delhi to court execution attended by five Sikhs. Until the Baisakhi of AD 1699, Sikh initiation ceremony, charan pahul, comprised the administering of charanamrit or charanodak to the novitiate. As Bhai Gurdas JI, Varan, I.23, records, this was the practice Guru Nanak Dev ji introduced for the Sikhs. At the ceremony the novitiate quaffed water poured over the foot of the Guru and vowed to follow the religious and moral injunctions as well as the code of communal conduct laid down. Later, masands or local leaders, specially authorized by the Gurus, also administered charan pahul. 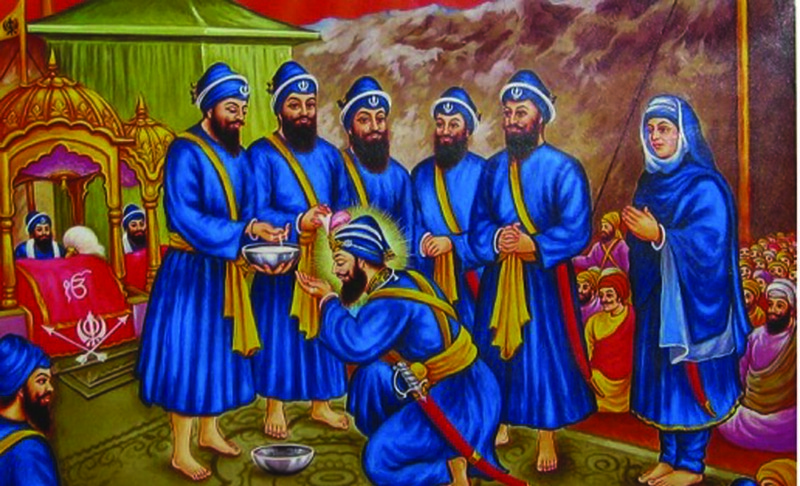 According to Kesar Singh Chhibbar, Bansavalinama, a modification was introduced in the time of Guru Hargobind when water, poured over the toe of the right foot of each of the five chosen Sikhs assembled in a dharamsal, was received in a bowl and administered to the seekers after ardas or supplicatory prayer. Guru Gobind Singh Ji emerged from the tent “hand in hand with the five”, says Kuir Singh, Gurbilas Patshahi 10. The disciples wore saffron-coloured raiment topped over with neatly tied turbans of the same colour. Guru Gobind Singh JI, similarly dressed, introduced his chosen Sikhs to the audience as Panj Pyare, the five devoted spirits beloved of the Guru. He then proceeded to perform the ceremony. Filling an iron bowl with clean water, he kept churning it with a khanda, i.e. double-edged sword, while reciting over it the sacred verses. Guru Gobind Singh JI’s wife Mata Jitoji, brought sugar crystals which were put into the vessel at the Guru’s bidding. Sweetness was thus mingled with the alchemy of iron. Amrit, the Nectar of Immortality, was now ready and Guru Gobind Singh gave the five Sikhs each five palmsful of it to drink. At the end, all five of them quaffed from the steel bowl the remaining elixir binding themselves in new fraternal ties. Their rebirth into this brotherhood meant the cancellation of their previous family ties, of the occupations which had hitherto determined their place in society, of their beliefs and creeds and of the rituals they had so far observed. The five Sikhs formed the nucleus of the self-abnegating, martial and casteless fellowship of the Khalsa Guru Gobind Singh Ji had brought into being. They were given the surname of Singh, meaning lion, and were ever to wear the five emblems of the Khalsa —kesh or unshorn hair and beard;kangha, a comb in the kesh to keep it tidy as against the recluses who kept it matted in token of their having renounced the world; kara, a steel bracelet; kaccha, short breeches worn by soldiers; and kirpan, a sword. They were enjoined to succour the helpless and fight the oppressor, to have faith in One God and to consider all human beings equal, irrespective of caste and creed. The episode of sis-bhet, i.e. offering of the heads was recorded by Bhai Kuir Singh in his Gurbilas Patshahi 10 (1751) followed by Bhai Sukkha Singh, Bhai Santokh Singh, and others. Earlier chronicles such as the Sri Gur Sobha, and the Bansavalinama do not narrate it in such detail. Ratan Singh Bhangu, Prachin Panth Prakash, simply says that “five Sikhs were selected, one each from the five castes, that they had received instruction at the hands of Guru Gobind Singh ji, was a devoted disciple and had been in residence at Anandpur long enough to have been affected by its ambience of faith and sacrifice. As they volunteered individually it was a coincidence that they belonged to different castes and to different parts of India. Khanda di Pahul, introduced by Guru Gobind Singh ji on 30 March 1699, became the established form of initiation for Sikhs for all time to come; so also the institution of the Panj Pyare. In fact, Guru Gobind Singh Ji had himself been initiated by the Panj Pyare as he had initiated them. Since then this has been the custom. Panj Pyare, any five initiated Sikhs reputed to be strictly following the rahit, or Sikh discipline, are chosen to administer to the novitiates amrit, i.e. Khanda di Pahul. Panj Pyare are similarly chosen to perform other important ceremonies such as laying the cornerstone of a gurdwara building or inaugurating kar-seva, i.e. cleansing by voluntary labour of a sacred tank, or leading a religious procession, and to decide issues confronting a local sangat or community as a whole. At crucial moments of history, Panj Pyare have collectively acted as supreme authority, representing the Guru-Panth. During the battle of Chamkaur, it was the last five surviving Sikhs who, constituting themselves into the Council of Five, Panj Pyare, commanded Guru Gobind Singh ji to leave the fortress and save himself to reassemble the Sikhs. Guru Gobind Singh had abolished the masand system and before he died, he also ended the line of living gurus. In the institution of Panj Pyare, he had created the nucleus of a casteless and democratic continuing society. ਇਨ੍ਹਾਂ ਦਾ ਕੀ ਮਤਲਬ ਹੈ ।?? Bhalla, Sarup Das, Mahima Prakash.